Michel Audet (Director General of Quebec in Brussels); Frédéric Tremblay (Dir. Bilateral affairs); Baudouin van Rijckevorsel (Economic Affairs), Stéphanie Franssen (Att. 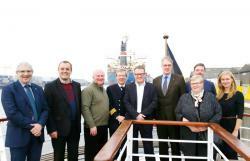 Bilateral Affairs), Aurélie Duchateau (DIV), Daan Schalck (ceo Havenbedrijf Gent), Dirk Vernaeve (havenkapitein-commandant), Peter Mortier (Adj. Directeur Generaal), Prof. Jan Mees (UGent – directeur VLIZ), Prof. E. Somers (UGent) en Prof. M. Vincx (UGent - voorzitter marineatugent). In case of interest with collaborations with Québec Universitities, Institutes, you can forward your questions to us or directly to Aurelie.duchateau@iv.vlaanderen.be. At this moment there is an open call for collaborations within the framework of the FWO bilateral cooperation (http://www.fwo.be/en/news/calls/bilaterale-cooperation-quebec/).